Scroll down to shop for featured skateboards. Use the menu to browse store sections. 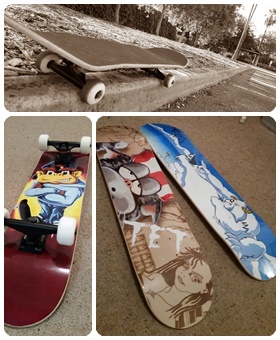 Skateboards should be skated, and my boards are no exception. Every scratch is a mark of respect because you went out and skated a deck that motivates you to progress and learn. I've been skateboarding since 1988 and I know I always skate better and learn faster on decks that I really like. I stock standard 8” Popsicle decks as well as longboard, cruiser, and retro shapes should you like to try something different for your second board. Buy just the deck or purchase a complete skateboard.